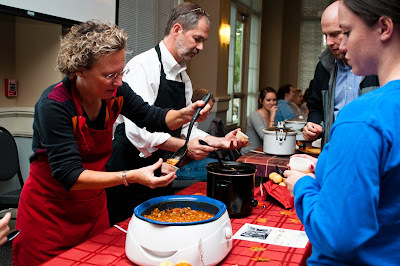 The diverse array of smells that wafted through Berry College's Krannert Lobby during the 3rd annual SOUP-Off enticed hundreds of Berry students and faculty to indulge in the all-you-can-eat extravaganza. To say that there were a variety of soups that were entered into the competition would be quite the understatement. Among the particapants were Lauren Franke and Danielle Krukowski. They represented The Berry Student Nursing Club and entered a gluten-free pumpkin ginger soup, paired with gluten-free crackers. The College Republicans entered a “GOP Gumbo”, with tasty chicken and sausage added. And the guys from the Conference Room, sponsored by Viking Fusion, made their third appearance in the SOUP-off with their always playful “Kids' Soup”, made up of milk, oreos, thin mints, and other various cookies. When asked why each group entered the SOUP-Off, the answers seemed varied. Beth Anne Dunagan, a representative for the College Republicans said that it seemed like a great platform to publicize the club. Lauren Franke suffers from Celiac disease and wanted to raise awareness by making a tasty soup that people could enjoy while also accommodating her diet. Steven Walker of the Conference Room said the group's fun 'soups' have always been well received and people enjoyed that their soup was always out of the ordinary. One common thread that these three participants share, as well as all 38 that competed in the SOUP-Off, is that they entered to help support the SOUP – the Sponsorship of Orphans in Uganda Project. 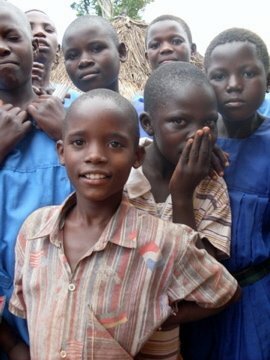 The project, founded by Berry senior Brin Enterkin, is to raise money and awareness for orphans in the remote village of Isita, Uganda. Among the needs that are attempted to be met are holistic living environments, proper education, and affordable medical treatment for the children. About thirty minutes into the SOUP-Off, Brin took to the stage to thank both the participants and those in attendance for coming out to the event. Brin shared the story about a young child named Adam, whose leg had been broken for five years and had never received proper help. As a result, his leg was wounded and infected. Brin realized the child was in pain and took him to a local medical center. The doctor informed her that if Adam had been brought in any later, he could have risked amputation or even death. 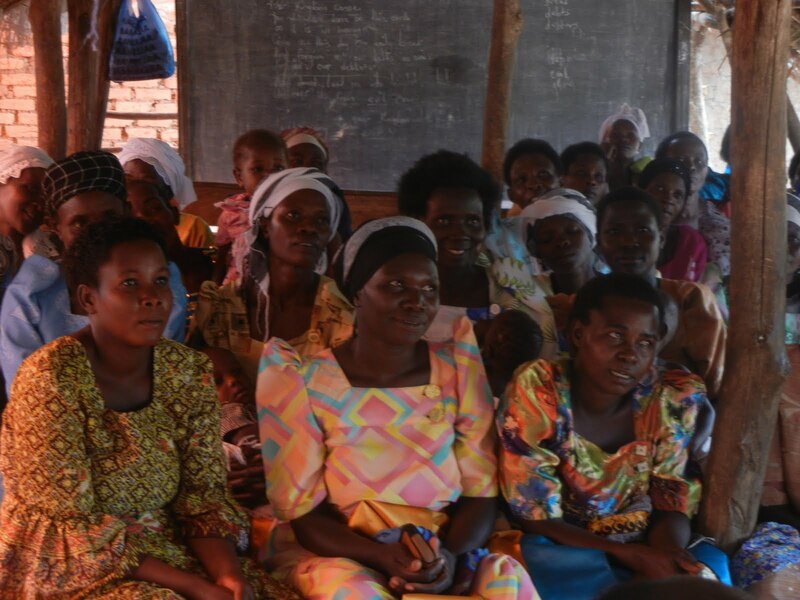 Brin stressed the importance of what improvements are still left to be made in Uganda, but “If even one child is helped, then the SOUP has done its job. The SOUP is here to stay!” I was able to briefly speak to Brin after she spoke to the crowd and asked her how it felt to see her passion come to fruition. Her face lit up and said that it felt incredible to know that two years ago, it was nothing and now it is a reality. Not everyone who walked into the SOUP-Off knew exactly what they were getting into. One such student, sophomore Josh Wilkinson of Seattle, Washington, was admittedly drawn to the event solely for the fact that he could consume all the soup that he wanted for just $3. However, he ultimately walked away with a greater knowledge of how much his $3 actually helped out the cause. There were also many first-time attendees who so enjoyed their time at the SOUP-Off that they intended on coming back as long as Berry kept throwing the event. The Sociology and Anthropology Club's potato soup walked away with the coveted 1st place title, KCAB's chicken and dumplings took home the 2nd place trophy, and the Berry Accounting Club's spicy chili was awarded the Trustee's vote. However, everyone walked away a winner in some from the SOUP-Off, whether they showed off their culinary skills or got to eat a lot of hot soup on a cold evening. The ultimate prize of the SOUP-Off, however, has nothing to do with a trophy or a tasty soup. It is knowing that each person in the Krannert Ballroom helped to support the orphans in Uganda who do not have the means to support themselves. This SOUP has really taken our work at the school in Uganda to the next level. You've probably already read that three medical students gave up their time to come perform full medical exams on all of the children. This was incredible! But once the medical students saw the reality of the environment our kids are living with, they knew that they had to come back out and follow up with all of the kids. They returned to the school two more times! They brought with them tons of medicine and band-aids. During these follow-up visits EVERY child at the school was de-wormed. People... this is incredible! So many of our precious kids have been suffering from worms that live and grow inside their little bodies. This not only has harmful physical effects, but is also extremely painful. 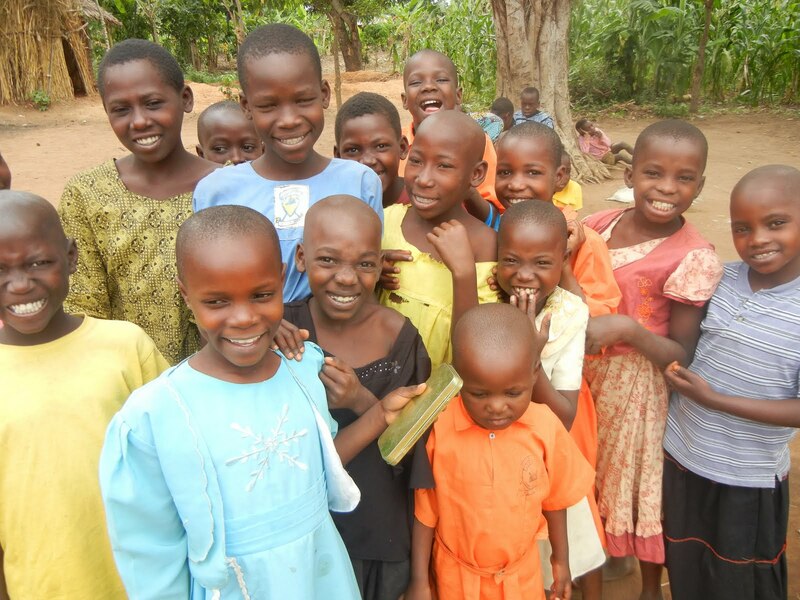 We will continue to de-worm the kids every six months to ensure that they are living the healthiest lives they can. While at the school the medical students distributed medicine, bandaged wounds, and touched the hearts of all the children! They have also arranged for free AIDS/HIV testing for all of our kids as well as a dentist to come out and check on all of the kids’ dental health. These medical students have exceeded our expectations by far. The willingness of people to share their talents and resources to help these children is absolutely inspiring! So now you ask: What ways can I get involved with the SOUP? Well, the SOUP has grown leaps and bounds this summer, and the best is yet to come! Email us at info@theafricansoup.org if you're interested! Today completely rocked my world. But before I start, I need to explain a few things. Right now, I’m sitting under a mosquito net, I am in a bed, and I am in a room with four walls. The walls are nothing special, but they are strong, dry and reliable. But right before I came into this room I sat on a wooden couch and ate rice and beans with my African SOUP partner, Michael. But WAY before dinner or bed-time I sat on a plane flying through the stratosphere sipping cola out of a very clean plastic cup. A nice woman handed me this cola on a napkin with an additional option of either cookies or crackers, but I kindly declined because of the filling previous meal. Fast-forward. Here I am sitting in this simple African setting. I do not have wi-fi or the capability to stalk on Facebook, but my mind is on overhaul. Today I went to the SOUP's new school/orphanage site. As I arrived, 200+ shy, yet eager children came out to greet me. They jumped up and down and a little one latched onto my leg. :-) I started to feel a bit emotional. These kids looked different. I couldn’t quite grasp the difference, but it seemed so evident. Then it hit me. These kids were being fed, educated, and cared-for. BEING CARED-FOR! They each lacked a lot. They lacked a few very obvious things, but as of right now, these children are whole, happy kids! This almost took me off guard; it was as if I was expected the same scene I ran into two years ago when I first visited the site. I was wrong and I am so overwhelmed. It was in the moment that I realized a very important lesson: our African staff, the SOUP staff, little old me, and all of our donors put together could have never made this happen. This was only made possible with the complete encouragement, grace and love of our mighty Savior. How beautiful! The new land we purchased last year (about 1 mile from the current school) has also made momentous strides. We have a building! It’s within weeks of finishing. It will be a new school with plenty of room for our beautiful kiddos to learn. We also dug a 30-foot latrine for the future bathroom facilities. Soon our kids will transition from the last location to this new one. Now that I have stated the steps we have made forward I need first explain what we are lacking (if you have a weak stomach, please refrain from moving forward and flip on a Lifetime flick). At the very beginning stages of the SOUP we planned on just meeting the physiological needs of the children (especially the completely orphaned children) in a very rural and impoverished community in Uganda. We basically wanted to feed them, clothe them and send them to school. However, as we began, we realized that our call was more than just providing the basic for the kids. We needed to do more and so we committed. We committed to building a new school, with a standard far higher than the first one, but more importantly, to build homes and families for these orphaned children. To clarify— Our charge has not changed. However, I’m afraid I overlooked the fact that every child in this community lacks so much. SO so much. I felt so terrible. These beautiful children were sick and I was doing nothing. I was clueless of such a serious threat to these kids. He noted that this was common and nothing personal. But it was personal. It is personal. These kids are no longer lost and forgotten-- WE, those who strive for supporting the least of these, will not allow that to happen. So before we move forward with building, each child needs a mosquito net and each child needs to be treated for worms. Michael and I will go out tomorrow and get the prices for these two items, along with ointment for that little girl. As I sit in this modest room in Iganga, Africa, I sit under a mosquito net, protecting me from malaria and other diseases. The very, very least I can do right now is also provide that opportunity for someone far more important than myself. I did not want to report my visit without being completely honest, so please do not think that such a terrible realization ruined my visit. We have come so far! It’s amazing the things that have been done in two years, but like I said we can do so much more! These kids deserve it. They are full of joy and full of life.